Choosing the right pillow is personal, and it is very important. The right pillow can create the most comfortable, rejuvenating sleep experience. The wrong pillow can leave you sleepless and may even cause neck pain. The Natural Sleep Store has many natural and organic pillows to choose from. One of my very favorites is the Pure Rest Natural Rubber Contour Pillow. It is made from flexible, natural rubber inside an organic cotton knit casing. I have always been a fan of, and slept on pillows that could be fluffed and flattened, molded and flipped, but over time our sleeping preferences can change. After waking up with neck pain every morning for what seemed like weeks, I wanted to see if changing my pillow would help. I went against my previous pillow loves and decided on the non-fluffable, non-flippable Pure Rest Natural Rubber Contour Pillow. It is a single-sided pillow so it can’t be flipped, but it does have two distinct ends, so it can be rotated. Contour heights are not standard and can vary by model. On the current Pure Rest model, one end has a height of 4.25 inches and the other end has a height of 5.5 inches. The different heights are meant to help support your neck and head when sleeping on your back or your side. I really didn’t want to like it, but switching to the contour pillow took the neck pain away. It supports my neck and cradles my head and seems to keep it in line. No more waking up with painful kinks! Pillow loft, fill and firmness are very personal preferences, and while a contour pillow is quite versatile, it’s not for everyone. For help in choosing the right natural and organic pillow for you, give The Natural Sleep Store a call! 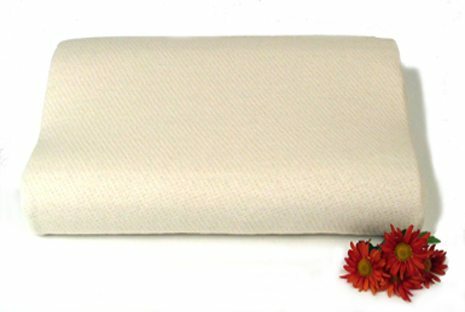 The Natural Sleep Store is pleased to offer the Pure Rest Natural Rubber Contour Pillow as our early spring giveaway! $110 Value. No purchase necessary to win. Giveaway runs from February 24th through March 31st. This giveaway is now over, Kimberly C. of Canandaigua, NY is the winner!